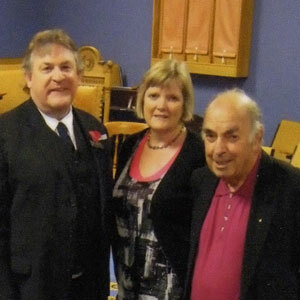 Rod Beattie (right) is pictured on 25 April 2012 with the W.M., W.Bro. John Wren-Potter, as they hand over a $20,000 cheque to Irene Mosley, Project Manager of the neurosurgery appeal fund. It was with some shock and much sadness that, in July, the members of the Lodge learned of the death of V.Wor.Bro. Rod Beattie, following a short illness. Lodge St. Patrick was Rod’s Mother Lodge, having been initiated herein in June 1983, and he greatly enjoyed the camaraderie that he experienced within its portals; in return he displayed much commitment to the Lodge’s well-being as one of its most vigorous members. As Acting-I.P.M., Rod conscientiously attended meetings and actively engaged in any necessary ceremonial duties, he was a marvellous inspiration and font of expert advice for the new Master. A lively character with a forthright manner, Rod was not averse to speaking his mind when he considered there was a need; his respected opinions being delivered with a commanding deep Scottish brogue, borne unaltered from his native land. 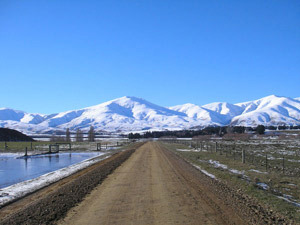 The breathtaking beauty of the mountainous country around Danseys Pass inspired Rod. Rod was a great lover of the outdoors and no doubt this was one of the significant draw cards that New Zealand held for him. He was a keen hunter and fisherman and, for the majority of weekends in any year, he could only be found in the ruggedly beautiful environs of his beloved Dansey’s Pass and the mountains of Central Otago – assuming that once there one could actually find him! In his personal life Rod Beattie was a very private person and a modest man in several regards, just prior to his death he requested that “no Masonic fuss” be made. As a result, but with regret, the Lodge accepted his wishes and a quiet private funeral was held for this stalwart supporter of Lodge St. Patrick – a member for almost 30 years. Rod passed away on Thursday, July 19th 2012 at Dunedin hospital. He leaves behind his dearly loved wife and best friend, Dawn, and his children, grandchildren and greatgrandchildren on all of whom he doted.